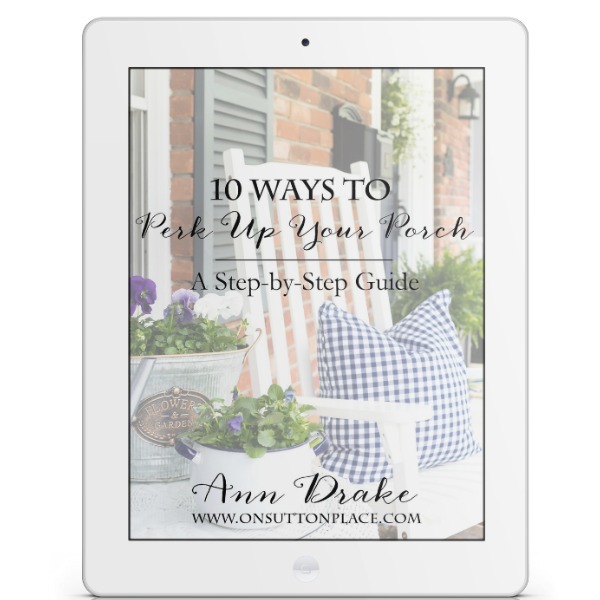 The Easiest Front Porch Planters Ever! Super simple and fast containers to dress up your front door. In just a few minutes your porch will go from drab to amazing! Right now, in this moment, I’m feeling a little overwhelmed. I’m not complaining or whining because it’s a fun sort of overwhelmed…but I know I need to prioritize and simplify if things are going to get accomplished around here. Some of you have asked how my makeover is coming along and I promise I will update you soon. For now, with Easter looming, I am focusing on my porch. I did think ahead a little and purchased two new planter boxes plus a couple of new accessories. Today I’m sharing how to make show-stopping, impressive planters in just a few minutes. These are truly the easiest front porch planters ever. Even though I love my olive buckets, I am ready for a change. I am moving the olive buckets to the deck and they will join my herb garden. I debated and searched for a while, but decided on these black planter boxes. I had visions of filling them with colorful blooms and that may still happen…but for now, I decided to keep it extremely simple and go with these lovely ferns. I promised the easiest front porch planters ever so that’s what I’m delivering! Lowe’s had rows and rows of healthy ferns for a great price, so I came home with two. I was hoping they might just set in the planter boxes and be fine, but no such luck. They sat way too low. To raise them up, I simply put packing pillows and plastic grocery bags in the bottom of each planter. You could also use packing peanuts. Not including the time it took to shop for the ferns, these planters took less than ten minutes. I may still actually plant the ferns in potting soil but if they do well and grow, chances are I won’t. You can use this method with any sort of front porch planter…even large, inexpensive terra cotta pots. Ferns are very forgiving too. They can be neglected for days and once watered, they bounce right back. They tend to collect moths but a good shake every now and then takes care of that. Here the planters are, at home, on our front porch. I’ll be sharing the sitting area and door very soon. I just got the porch cleaned yesterday…and what a good feeling it is to have that task finished. Affiliate links included. Click HERE for my disclosure statement. 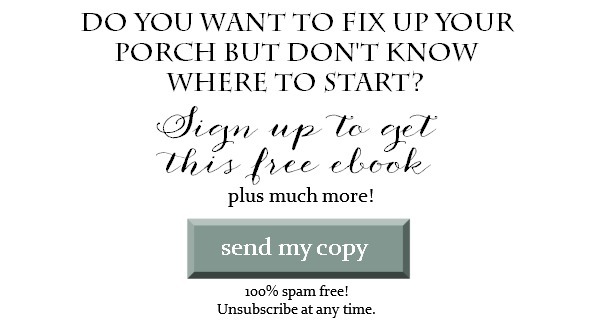 More front porch sources can be found in my Amazon Shop. See the rest of the front porch! Now it’s time to send you along to visit my farmhouse friends. As always, they have wonderful things to share. I’ll see you soon! Love the look of your ferns and the containers. Do Boston ferns do well outside thoug? I had them once and the leaves kept dropping. There is another species of ferns, are they much better for outside? 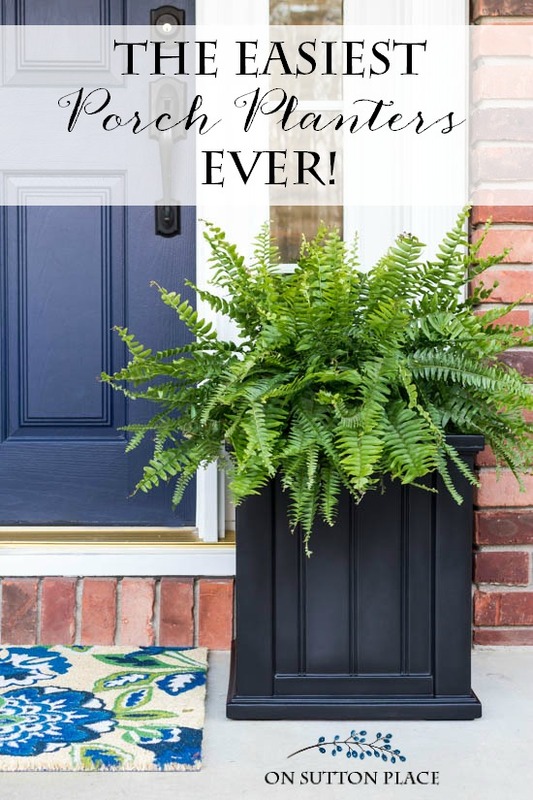 I simply lo-o-ove the look of the planter and the fern….what an easy way to dress up a front porch! My problem is that I’ve had problems keeping ferns healthy so I’ve stayed away from buying them. I’ve always been told ferns are a shade-only plant so putting them on a sunny front porch possibly wouldn’t be a good idea. And I’ve been told ferns need “misting” quite often. I guess I’d better do a little more research before I buy my planter. Lol! Hi Kathryn…ferns do need shade that’s true. I really don’t do anything to my ferns but water them! ♥️ Your ideas for the front entrance hope I can find ferns like this . We use plastic water bottles in the bottom of our large planters. 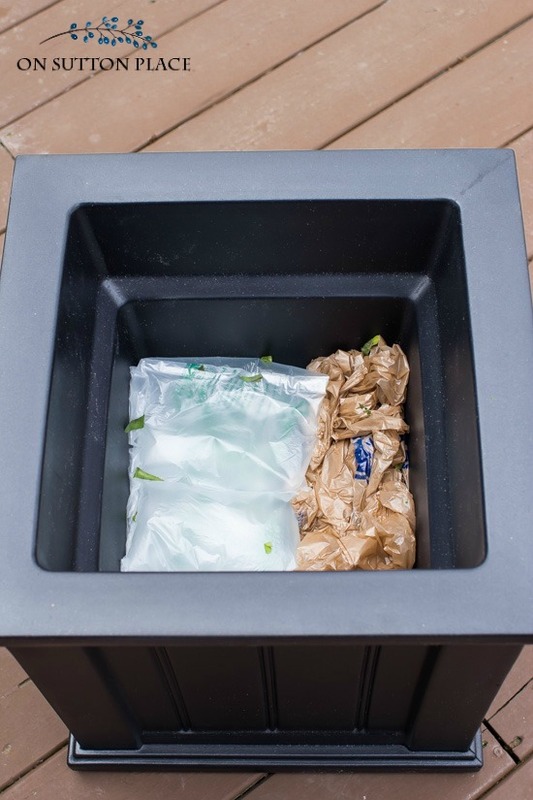 It makes the planters easier to move and does not require so much point soil to fill the container. Love it. Ferns are such a simple way to dress up an area. They look awesome in the black container. Thanks so much for your great recipes too. I recently made your strawberry walnut bread. Awesome. I would never have thought to roast the walnuts. What size are your black square pots, as I see they come in different sizes? Hi Sue! My pots are the 16-inch squares. My porch is pretty small but if you have a bigger space, you could definitely size up. Thank you! My planters are empty at the moment…..LOVE this idea. I will keep my eye out for some ferns. The planters are lovely – and I’ve been looking for color for my cabin porch! However, I thought you were going to teach us how to “make” them (like the floor cloth). I was sad to discover they were $102 each – way beyond my budget. I do , however, love and use ferns. Hi Kedra! I don’t have the skills or equipment needed to make something like a planter box. By the time I bought everything and learned how to do it, I would have spent twice what the planters cost! They are a bit pricey but will literally last forever. The honest truth is that they are better than anything you or I could ever make…if it’s the look you want. I didn’t mean to disappoint, just being honest about my life and my limitations. Thank you! I love my gardens. But I can’t keep up anymore & I have also found hanging baskets are a lifesaver! I just set them in my pot & like you raise them if necessary. (I have used floral foam blocks.). By removing the hanger it looks like they were pottted just for that container! And I use ferns too. Floral foam blocks are brilliant…thank you for sharing! Love the planters! Would you share the paint color on your door, please? Thanks! The door color is Naval by Sherwin Williams. I love them! I can’t wait to get a few. Thanks for sharing! I think your porch planters look great and I am going to try them on my back porch. I also will try to get some of the youth at the church I attend to build 3 for the courtyard at the church. Thank you for sharing. I love it! Looks great! I had ferns hanging on my porch at our old place and birds built nest after nest in them, even building a nest ON TOP OF another. It was heartbreaking. We had to keep removing the nests because one year we found a few abandoned nests with abandoned baby birds in them–it was heartbreaking :( Someone I used to work with told me that in the future I should grab a few plastic snakes from the Dollar Tree and weave them into the fern towards the bottom of the plant–I did and it seemed to work. I don’t know if you deal with nest problems or not but thought I’d pass that tip along!! WOW I love your new planters and ferns. 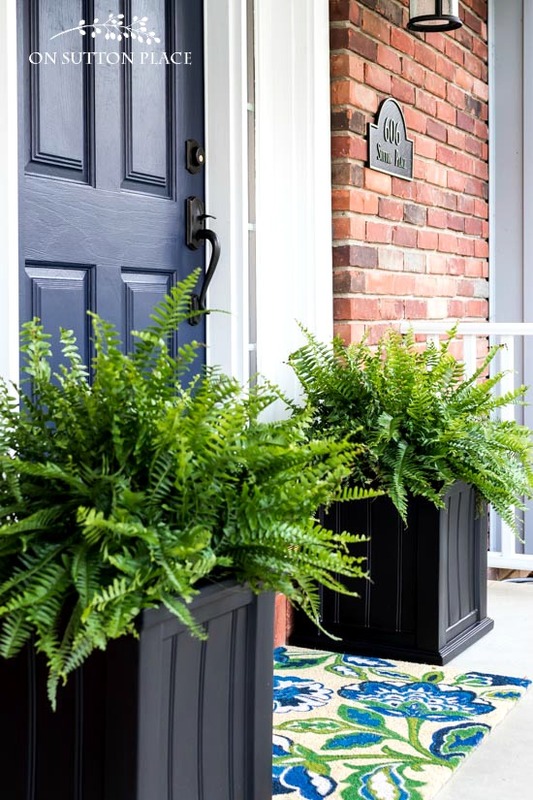 Have always loved the ease and beauty of ferns; your black planters really make a statement at the front door. Very nice. Thanks for this. I have been shopping for tall planters and came across some that are hollow like this. I wasn’t sure how to plant them, thinking that filling it up with that much dirt would make them too heavy to move if I need to rearrange. I’m going to give it a try. Thank you so much for this post. It’s very timely for me! Great idea, ferns are so beautiful, I just love your cheerful porch! When I need to fill the bottom of a large planter, I go to the recycling and get aluminum cans. Takes up lots of space and leaves air space for drainage. The planters are beautiful, I had a white one in my back yard for years on my patio filled with a fern in summer and coleus in fall. Never planted them in, used smashed water bottles, cans, or milk cartons until it was time to change the plants then I just recycled the used bottles or cartons and started fresh for next year. No mess incontainer and could move it any where ???? I love the planters! I was going to make some just like those, but when I saw that these were plastic I was sold, no painting! Thank you for sharing, mine are coming tomorrow, can’t wait. P.S. Sometimes I’ve used an empty planter or pot turned upside down inside a container to give it height to sit a hanging basket or other container on. What a great idea! So simple and easy, yet the ferns are so beautiful. Sometimes simple is better! Love them accented by the black planters. I always look forward to your posts – feel like we are friends. Certainly turned put pretty and very easy, but won’t that make a nasty wet mess on the inside of the container when you water? Bricks would certainly work but are way too heavy for me…my thought was to keep it light-weight. Great idea though! I am still so in love with your olive buckets, but I know the need to want to change things up every now and then. 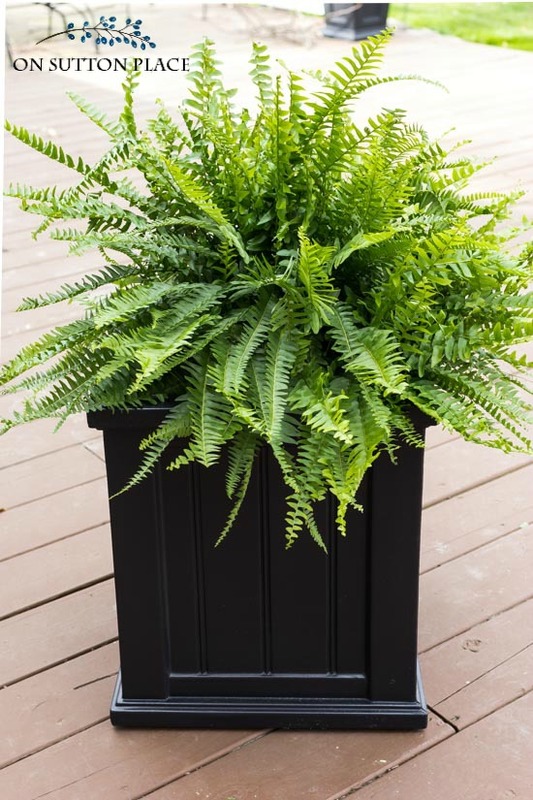 I love the simple, classic look of the black planters contrasted with the bright green ferns. They look as if they were made for each other. I have yet to see any ferns that are as glorious and bountiful as yours, I’m taking a Lowe’s trip tomorrow. 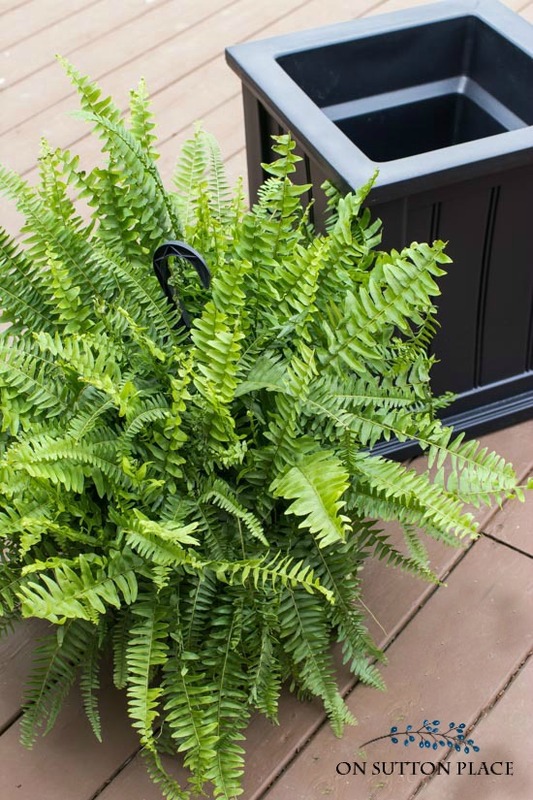 These planters and ferns make such a wonderful yet simple presence on your porch! Hi Ann, I love your olive buckets but I also just love your new black Containers! Your rug just pops with your new ferns. I live in a Chicago suburb and for the last five years or so I’ve used the ferns just as you did. They always look great and are easy. FYI: I’ve never had the need to transplant them. They always do great in the original pot but I do fertilize them weekly. HAPPY EASTER!! I buy eight of these every year and simply put pot in all my antique outside urns….easy peasy and they grow beautifully! Can’t wait until the ferns are available in our area. I had them for two years & I loved them!! The only problem I had in September was what to do with them as they had grown too big. The span of them was almost 3 feet & I didn’t have room for the two of them in the house. But I will get them again & enjoy them this spring & summer. Love the contrast with the black planters also! Ann, you have done it gain, impress, impress, I just love Boston ferns too, they are so hardy and even withstood a few cold snaps in my hometown of Pearland, Texas. We are between Houston and Clear Lake (NASA). Also, I really love your doormat the colors are gorgeous. As always, I love your blog. Have a happy and blessed Easter and don’t eat too many chocolate bunnies. I love this very simple and economic idea. So very easy. Thank you. love the tiny blooms… at first glance they do not appear to be paper!! Great idea!! I love ferns. Either as hanging baskets or in a planter. Sounds as if you have a lot on your plate right now. So smart to keep it simple. And in this case, simple is simply lovely. Love the looks of your porch. Simple is simply lovely! I always use Boston ferns-they do so well on the north side, which is what I need. I heard these tips several years ago, and I’m convinced that it is how I keep mine so pretty for so long into the hot summer. 1. Never fertilize. 2. Mist with water every few days. They seem to thrive on the moisture (but not wetness) among the fronds. There will always be fronds that brown out, but I just clip them off close to the crown, and new, fresh ones will appear! I love your blog, and while I’m not usually a “comment-er”, rest assured that I read and enjoy every post! The planters look great! Simple and perfect! I always think that ferns look so elegant. The black pots also help in that regard. They look very nice flanking your door. Hi Ann, Thanks for the great idea! They look lovely. I have similar planter boxes and use a gladware container turned upside down to give the pots some height. I use the same ones year after year. Another tip I have is to slice up pool noodles and put them in the bottom of large pots then plant on top of them. They provide good drainage and the pots aren’t so heavy. These are reuseable too. Great minds run the same. I do this on my porch. My neighbors just think we are so smart!!!! I did this at my church entrance also. and put a wooden bench between… Everyone just oos and awes how how quick and pretty it is. Thanks for always inspiring us, Ann.. and don”t fret too much on your latest project. It’s going to be great!!! I put a mixing bowl under mine (garage sale!) and fertilized them every week (pour fertilizer into the bowl ) to keep it growing and looking great all summer and by fall they were huge! our winters are below zero in New York state, and I felt so badly about throwing them out, so brought them into my heated 4 season porch to over winter. last week I started fertilizing them again and hope to get them back out in their planters by memorial day– I read that ferns don’t like temperatures below 55. I love the simplicity of the planters and the way they accent but not overpower the floral rug. Just beautiful. I’ve used ferns on my porch several times. I’ve always loved the softness and the lush green color. Your porch is always so pretty. Love your doormat too. Love your page and all the ideas….will you over winter the ferns after season? I’ve been following Floret Farm website for a year or so. Not a better place if you love cut flowers like I do. That place is amazing. Also…love the planters. I may have to copy that idea! I love those planters. I was going out today to buy the big terra cotta planters for the front porch but I like the higher look of yours. Have to re-think what I,ll be doing now. Choices,Choices. Oh my Ann. You sure make my brain work.lol Love all your ideas and such. Anyway, thanks for showing us how to update a front porch with not much cost. Love your site. This is going to be my front porch.our house is brick & my husband had been planning to make a railing on the side. I have used ferns before because they look so lush in a pot or box. I just ordered this gorgeous planter! I have a small conifer type tree in a planter on my front porch but this one is so much better!! Thank you for always sharing such great ideas and styles. I’m looking forward to seeing your posts on the house renovations! Love the handsome planters, looks great with the nice size ferns. Love the planters but you didn’t tell us where you got them.